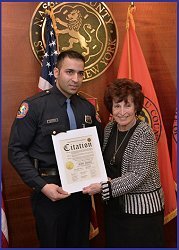 Nassau County Presiding Officer Norma Gonsalves had the honor of recognizing Nassau County Police Officer Mohit Arora as one of the county’s “Top Cops” at a recent meeting of the Nassau County Legislature. Officer Arora was injured in the line of duty while arresting a suspect in 2013. On August 14, 2013 Officer Mohit Arora responded to an Occupied Burglary assignment within the confines of the Third Precinct in which the homeowners were hiding in their home from a subject who was still inside. The subject suddenly turned and fired multiple shots from his hand gun towards the Officers, one of the shots struck Officer Arora who collapsed to the ground from the bullet wound. Other Officers exchanged gunfire with the subject before he fled the scene scaling a fence into a nearby schoolyard. The Officers remained with Officer Arora and rendered first aid. A description and direction of travel of the armed assailant was transmitted via radio. Multiple Officers from the Third Precinct responded to the scene and searched the area for this dangerous subject and apprehended him. Due to the ongoing Criminal Case against this subject which just came to an end, Officer Arora was unable to be recognized sooner for his bravery and heroism. Pictured are Officer Arora and Presiding Officer Gonsalves.